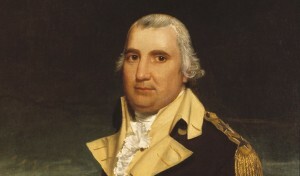 The cousin of Charles Pinckney, C. C. Pinckney fought in the American Revolution and in 1796 was appointed U.S. minister to France. Refused recognition by the Directory (the French revolutionary government), he was joined in 1797 by John Marshall and Elbridge Gerry in an effort to establish diplomatic relations with the new government. French negotiators (in Pinckney’s correspondence called “X, Y, and Z”) solicited a bribe in return for official recognition. Pinckney indignantly refused, and the resulting “X, Y, Z Affair” triggered an undeclared naval war with France to protect U.S. neutrality rights and rights of navigation on the high seas. Pinckney’s steadfastness was a key to the defense of U.S. sovereignty in the earliest days of the republic.